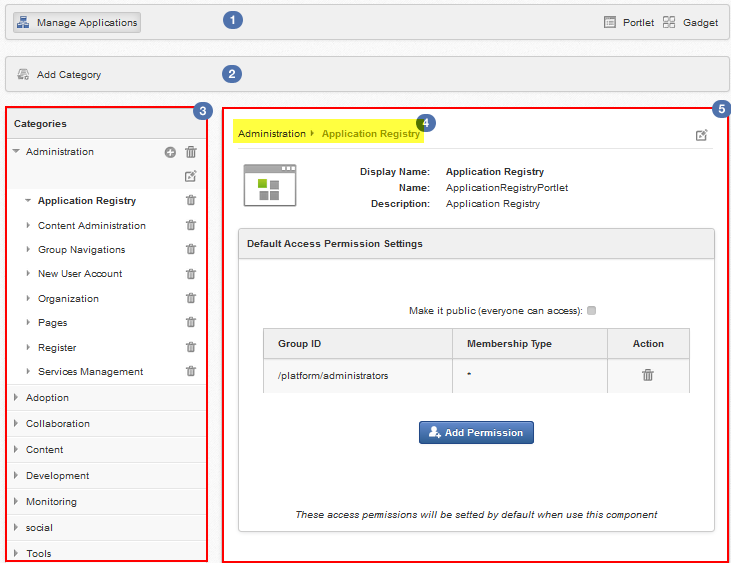 To manage categories, portlets and gadgets in a portal, you first need to go to the Manage Applications page by clicking on the top navigation bar, and select Applications. The Manage Applications page will appear. Tab bar consists of two items, including Portlet and Gadget. Action bar consists of actions related to adding a category and importing applications. Left pane lists all categories and portlets/gadgets of each category. Breadcrumb bar is the path from a specific category to a specific portlet/gadget in that category. Right pane provides the detailed information of a specific portlet/gadget. Portlets and gadgets are organized into different categories. Each category contains one or several portlets or gadgets. You can also mix portlets and gadgets into one category. By default, all gadgets are placed in the Gadgets category.